Slats? - What material are the slats used for the pergola? Can you please tell me who manufacture them? I am sorry this Pergola was designed and specified for the Client by the Landscape Architect Nathan Burkett. I am sorry we are the Construction Company. You would have to contact Nathan Burkett Landscape Architects to find out the answer to this question. outdoor dining setting - where can i buy the outdoor dining setting from? The outdoor setting was supplied by Nathan Burkett Landscape Architect but I think the chairs might be from Tait Outdoor furniture in Collingwood. Perhaps have a look on line at Tait and Nathan Burkett's website. The pots were custom made by the Landscape Architects NaThan Burkett. Are these pavers or concrete? Render colour - Hi. I'd like to know the render colours please. Where did you purchase that beautiful outdoor setting? BattensTimber battens won’t keep out the rain, but if shade is your goal, this is a stylish material to consider. 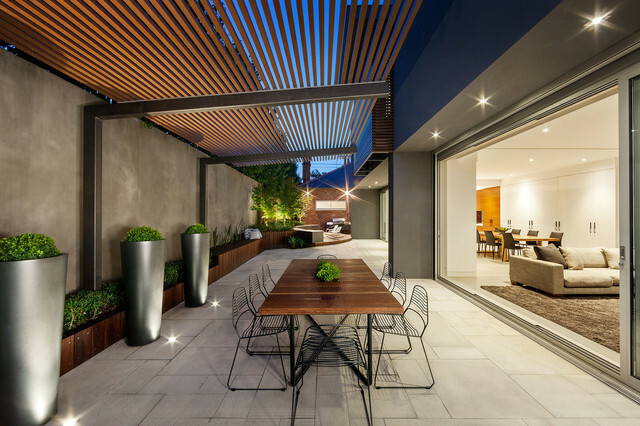 The timber dining table and planter boxes in this Melbourne home’s outdoor entertaining area bring the look together. 8. Wooden slatsThis modern style of shade protection is right at home when integrated with a sleek contemporary property. For a structure like this, choose a durable wood to ensure many years of use. Make sure it is certified by the Forest Stewardship Council (FSC) to be sure of sustainable harvesting, and protection of wildlife and the people whose lives depends on the forest. 2. Look to the sideIf your site is wide enough, consider setting up your main outdoor space to the side of your house. Add in large expanses of glass, as the owners have done here, so that both your alfreso area and living spaces are bathed with light. This arrangement also allows light to flow through to all adjoining rooms.